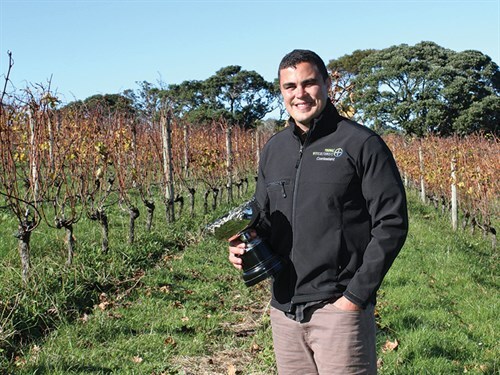 Jake Dromgool from The Landing in Kerikeri, who became the Bayer Auckland/Northern Young Viticulturist of the Year 2018, is the first Northlander to represent the region at the National Final at the end of August. "My career ambition is to see the Bay of Islands recognised as being a destination for fine wines, fuel the growth of the industry within my region, and to help take wine from the North to the world," Jake says. "I believe that despite the obvious difficulties of viticulture in the North, we have something to offer the market that no other region can quite match." Jake has planted his own vineyard and recently also launched his own wine brand called 144 Islands. The Auckland/Northern Regional Final was held at Goldie Estate where the five competitors undertook a mix of practical and theoretical challenges covering all aspects of viticulture, including pruning, trellising, pests and diseases, soil nutrition, and budgeting. Jake will now compete with five other contestants in the National Final this year being held in Martinborough. There are major prizes for the National winner, including a Hyundai Kona for a year, $5000 AGMARDT Travel Grant, cash, Bahco golden secateurs, and a leadership week where the winner travels New Zealand to meet influential people from the within the wine industry as well as learn from leaders of other industries.